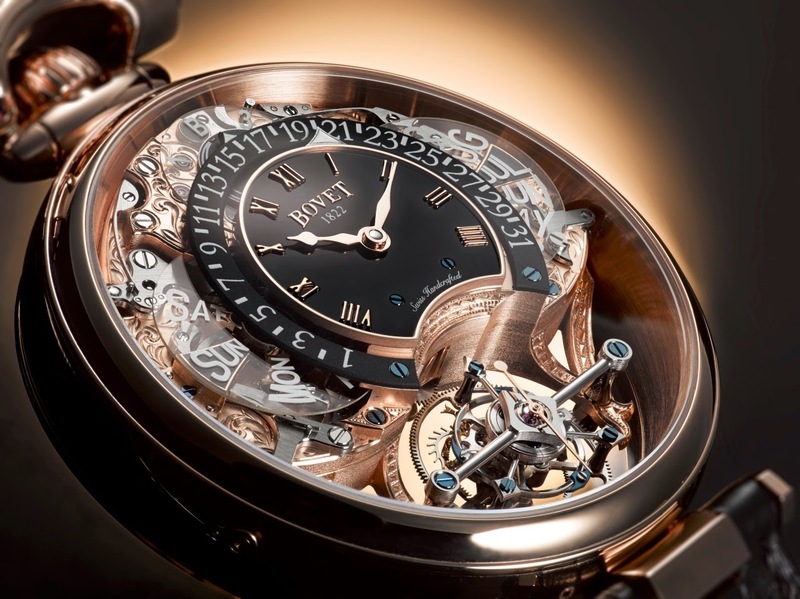 The first stage in the process of developing a BOVET timepiece is to define its functions and aesthetic qualities. Straight away the timepiece is conceived as an entity by a body of watchmakers, designers and different watchmaking specialists (case-makers, dial-makers). Much more than the sum of their parts, BOVET 1822 timepieces are developed as a seamless and coherent whole, both technically and aesthetically. The first validation of a new project focuses on the functions of the movement, the visual impact of exterior parts, and how and where the different indications will be displayed. The designers will seek the solutions and the blueprint required once a drawing has integrated all preferred functions according to a chosen aesthetic composition. It is a process which, from the very outset, places creativity on a par with technical considerations. The specification given by Pascal Raffy to his teams for the development of this new grand complication referred to a tourbillion movement associated with a perpetual calendar, with one of the main conditions being the unimpeded view and transparency of the tourbillion cage. Moreover legibility, often the Achilles’ heel of perpetual calendars, needed to be optimal. Once the main outlines of the timepiece were determined, the choice of a retrograde perpetual calendar inclined naturally towards one which would allow the tourbillion cage to remain visible at all times. The design office of Manufacture DIMIER 1738 then found an effective solution to the problem of legibility. Traditionally, calendar information is positioned centrally on the dial, leaving hours and minutes to be displayed on the perimeter. The choice made by Pascal Raffy consisted quite simply in doing the opposite. Hours and minutes are therefore displayed on a central dial. Since the human eye is accustomed intuitively to interpreting this type of analogue display, reading the hours and minutes poses no problem despite the reduction in size. This left the periphery of the dial free to accommodate the day and month indicators. Their exceptional size and diametrically opposed position allowed for the use of larger inscriptions. To further enhance legibility, the names of the days and months were printed in white or black (depending on the colour of the dial) on sapphire discs. This transparency allows the subtleties of the mechanism to be admired without taking up excessive space. In place of plain apertures, black or white plates now distinctly reveal the name of the current day and month. The calendar display, placed outside the hours and minutes dial, was positioned concentrically to the latter. 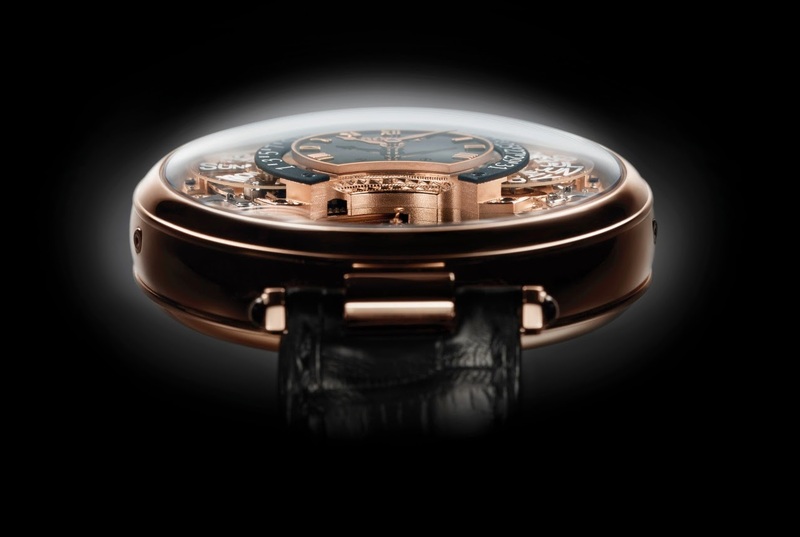 Its specific dial covers an arc of 240°, leaving visible the location of the tourbillion cage. For aesthetic reasons and to further enhance legibility, the calendar’s hand was placed under the hours and minutes dial. Only its arrow is visible, appearing mysteriously on its graduated scale. To enable this hand to move backwards within such a small arc and to accommodate the retrograde mechanism under the small hours and minutes dial, the watchmakers of DIMIER 1738 were asked to develop a special millimetric rack which has since been registered as an international patent. Two concentric discs positioned at 12 o’clock complete the panoply of genuinely useful information. One indicates the leap year cycle, while the second provides a valuable indication of the power reserve, in this instance an extremely generous five days. Ensuring faultless timekeeping, the large tourbillon cage is positioned at 6 o’clock. The arms connecting it to the three-quarter plate emphasise its contours and combine with the circumference of the dial to form an “8”, the symbol of good luck and prosperity. The dimensions of the tourbillon, its inertia, and the design of the balance-spring manufactured by DIMIER 1738, allow the heart of the timepiece to beat at a frequency of 21,600 V/h, without compromising the extraordinary power reserve of a movement featuring no fewer than nine complications. The architecture of the cage and the exceptional finish given to each of its 69 components is directly inspired by BOVET 1822 timepieces manufactured at the dawn of the 19th century. Included for example are characteristic blued dynamic inertia-blocks, the escape wheel, whose two arms describe a yin/yang motion, and pallets with weights. 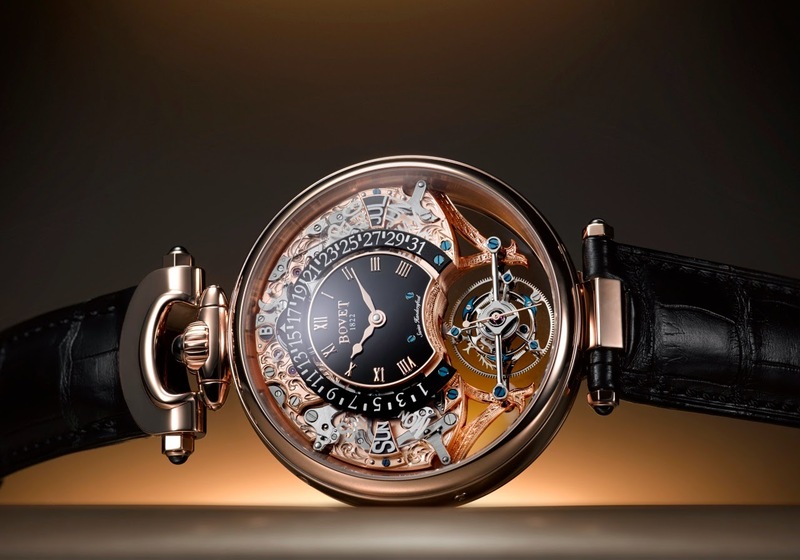 Because of the reversibility of the timepiece, each component is decorated by hand on both sides. As is customary, artisans at the Manufacture spared no effort in their work. Worthy to mention are the sharp edges of re-entrant angles and rounding-off of the tourbillon cage bridges. Two operations for which only the expertise of the human hand can obtain a result satisfying the rigorous quality criteria of BOVET 1822 and DIMIER 1738. To complete the comprehensive range information provided by this timepiece, one must mention the reverse hand-¬fitting, which allows hours and minutes to be displayed on the reverse side. This original characteristic, present on all timepieces in the Grandes Complications collection manufactured by DIMIER 1738, owes its presence to the convertibility concept of its Amadeo®case. Appearing for the first time in 2010 on all Fleurier models, the Amadeo® case allows the timepiece to be converted into a reversible wristwatch, a table clock or a pocket watch without the use of any tools whatsoever. The different faces thus acquired by the timepiece fully justify the use of the tourbillon, which was invented to offset the effects of gravity on the operation of a timepiece when its regulating organ is in a vertical axis. This is necessary for when the timepiece is used as a pocket watch or a table clock. For Pascal Raffy and the artisans of BOVET 1822, technical qualities and chronometry would count for nothing without the application of decorative watchmaking arts. This perfect alchemy continues the tradition of virtuoso interpretations of fine watchmaking practised by BOVET since 1822. The reverse hand-¬fitting is displayed on a lacquered dial, with two matching plates showing the individual number of the timepiece and the number of jewels in the movement. At the request of collectors these two plates can serve as the base for a magnificent decoration, which can be personalised with text, an engraving, or a miniature painting. Despite the complexity of the movement and the interaction of its numerous mechanisms, all surfaces of bridges and plates, be they concave, vertical or invisible, have been engraved by hand with the Fleurier motif beloved by collectors for 192 years. The use of sapphire to manufacture the day and month discs allows the owner to admire the mechanical ballet played out in the noblest of settings. A contemporary solution which would have pleased Edouard Bovet, himself a pioneer of transparent case-backs revealing the scope and virtuosity of artisanal craftsmanship. The design of the case also draws inspiration from its prestigious forebears. 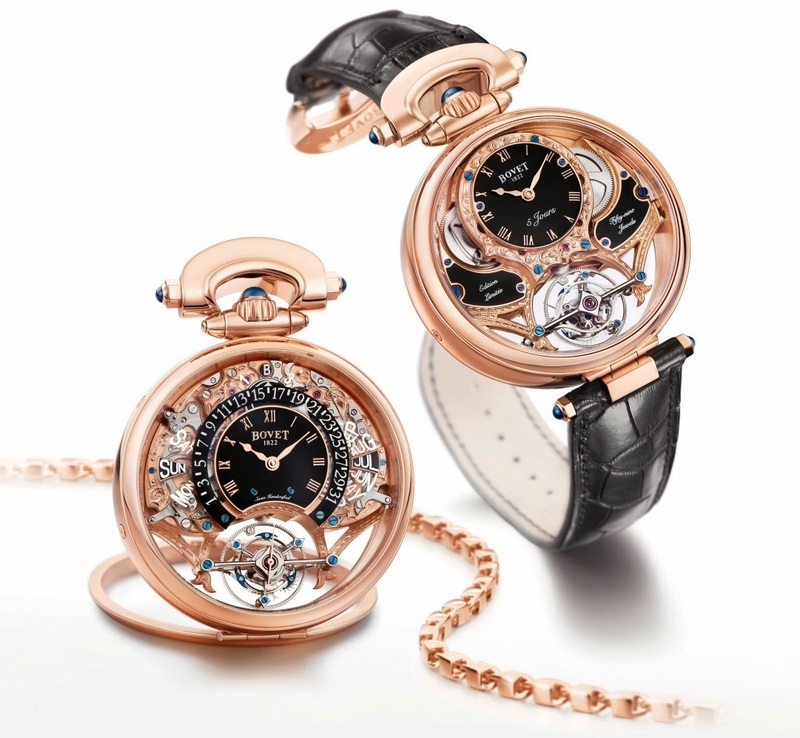 The two crystals are curved to evoke the Grand Feu enamelled case-backs of pocket watches manufactured by BOVET. This particular characteristic influenced the very architecture of the movement, since watchmakers concentrated the thickness of the movement in its centre, in order to optimise space requirements according to the theory beloved by Le Corbusier. The Virtuoso III Tourbillon extends the ability to travel in time by drawing inspiration from its historical heritage. A push-piece coaxial to the winding stem and located on the pendant enables the case-back to be opened in the manner of BOVET pocket watches of the 19th century. A welcome addition to the Grand Complications collection offering genuinely useful functions, this Tourbillon Virtuoso III is a beautiful and cultured addition to the world of fine watchmaking and keeps alive an unrivalled degree of expertise, bringing BOVET’s past resolutely into the future.